Hi there.. I hope I am posting this in the correct place. Is there any way to delete comments made by end users on your knowledge base articles? In the case of spam or distasteful comments? Yes! You need to be a HC Manager or have the ability to moderate the section in which the article (and thus the comment) is. You just locate the comment on the article and click the Delete link, which depending on your customization is usually at the bottom of the comment or in a drop-down with a little gear icon. Is there a way to designate some of our users are "Community Moderators" as Wes Drury is here in this thread? One of our Mods actually posted a Tip on this very topic! @Laura D. any updates on the multi-language communities? The issue with how you've "faked it" is that it adds more and more topics presented to the end user to select from the dropdown when posting. This gets messy fast and is not at all user friendly. I just found this thread with a hack for Hiding Topics by language. Any way to make this hide posts by language? This could work in the interim. A proper language filter with a "show all" option would be best so that users could look at responses in other languages for reference if one in their language didn't exist. Laura alerted me to your question. We are aware that multi-language communities are a need and that the current "hack" isn't cutting it. Though its not currently on the roadmap, we hope to support multi-language communities before the end of this year. How can I view all comments that have been made on help center articles? @Allen Hancock: Thank you for that. What I'm really look for is a listing of all comments, or at least the most recent comments. I'm very concerned that I might miss replying to someone, and I don't want to turn on moderation to do that. People in general interact less with brands that moderate their comments. Agreed Will.. I don't think the the view you're looking for exists.. it's just a matter of Following all your categories for Comments+ Replies, and at least then you'll get emails as comments come in. @Allen Hancock: That appears to be something that would work, but that's very time-consuming and seems like a hack. Not your fault, of course. Thanks. I can confirm that email notifications are currently the only way to monitor the activity in your Help Center. I myself monitor the activity here with a designated Gmail inbox, and I use filters and labels to sort notifications and indicate what actions were taken on a post. It's not as smooth as it would be if something existed in-product, but it works very well for us. Feel free to ask if you have any additional questions about it! אני עדיין לא טופס את השיטה אי עובד מישהוא יכול לעזור לי ליכנס לקהילה ולתחיל לעלות פוסטים? Agents can use the CRM to respond to Facebook, Twitter, now Google Play, but not the community that is hosted by the CRM. This is unfortunate. Zendesk should prioritize allowing community posts AND responses to automatically create new tickets, just as other social media sites do, . It would be so helpful for companies that want to engage with every customer within the Zendesk agent portal. 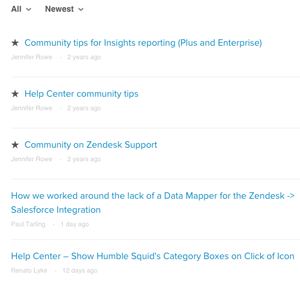 @Will Strohl @Tanya Sawyer Could you set up a rule in your mailbox to auto-forward community notifications to your Zendesk? A business rule could tag them for a Communities Ticket view. 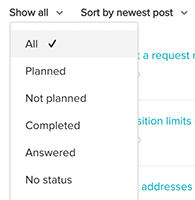 The only downside is they would all be from one sender (either your inbox name, or the Community notifications email if you enable agent forwarding), so while you could keep track of all comments and solve as needed, they won't tie back to your end user's profile automatically. @Zac Garcia I like your proactive thinking! I do think this would be problematic because all comments, including agent responses, would create a ticket. So, although we could create a problem code to not include all those tickets in reporting (to not inflate my ticket count) and try to manage it, it still feels like a manual process. What other ideas have you got? Way to put me on the spot, haha. I'm unsure of how to answer. We don't have this feature active in our Zendesk, so I don't have a notification email to reference (besides the one I just got from your comment!). It would be hard to see the difference between an end-user response and an agent response. However, if there are any text strings that will reliably be in every agent response notification (but not in end user ones), you could add a trigger - based on that string being in the ticket description - to set an "agent_community_response" tag. You could then exclude tickets with that tag from relevant views and reporting. Still pretty manual, but without official support, anything coming from a single sender will take a little bit of upkeep. I'm loving this conversation. :) Unfortunately, trying to get Help Center notifications into your Zendesk as tickets is going to result in bounces, since Zendesk is built to reject emails that come from no-reply addresses. Plus, as Tanya observes, it's going to create A LOT of tickets. Further, unlike the other social media channels that are available with Zendesk, even if you could get them into Zendesk there's a good chance they wouldn't thread properly, and responses in the ticket itself wouldn't automatically go into the Help Center. We've actually created an email account specifically for Help Center notifications. That email address exists in Zendesk as an end-user, and it is subscribed to every Section and Topic in the Knowledge Base and Community. Now, I know what you're thinking. "THAT IS SO MANY NOTIFICATIONS." You are not wrong. However, I have filters set up so that stuff I don't have to see gets labeled and filtered out of the inbox. Each notification has a link directly to the post or comment, so I use that to go to the thread and read what's going on, and determine what action (if any) should be taken on the post. I then have other labels set up, which I apply to the notifications so I know what action has been taken on a post or comment. Some labels stay in the inbox so I can go check on them later. Some get archived. Sounds like that workflow could work really well with Google Inbox (though labeling is definitely not as easy in Inbox, the bundling and Snooze features are awesome). Thanks Jessie! It would be awesome if triggers could be applied to community posts! One of the main issues we are trying to solve for is that while agents can easily see a new post that requires a response (because there are 0 responses), they sometimes miss when a customer replies to an existing thread, or a new customer adds "I'm having this problem too" to an existing thread. If only there were some way to have a trigger fire off a notification only when new posts were added to threads by someone who is not an agent, we'd be all set! No problem. :) We actually use Gmail here at Zendesk, so that's part of what makes this work really well. I haven't tried doing it in Inbox, although that's a really interesting idea. For me, though, the big question would be whether you can turn off threading in Inbox. I have threading turned off in the Community inbox because it gets too hard to follow what's going on when every reply ever is bundled into the same conversation. Might be work checking out, though! @Jessie Schutz is the product team looking for customer feedback on using the CRM for community? If so, is there is a user group for this and can I be added? As I mentioned above, things are very much in the initial stages. I don't know what their plans are for getting feedback from customers, but I'll be sure to mention that folks in the community would be interested in weighing in on it. I'd also encourage you to check out our Product Feedback forum to add you thoughts to any existing conversations, or adding a new post of your own. We are doing research to better understand the issues you face moderating and managing your Community, and how that impacts your workflow, community strategy and growth. If you would like to give your feedback directly to the Product team and help us understand your use-case and needs, please fill out the form and we will be in touch. UPDATE. We just released a stable version of the app 'Help Center to Support'. Try it for free! 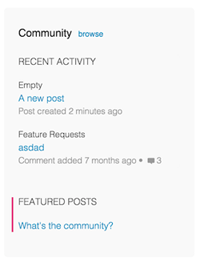 Hi, I'm wondering if there is a way to have users who post content to Community appear as anonymous to other users. Or, at least, anonymize them enough so that there isn't a way for a different user to figure out who they are or who they work for. From my poking around, I haven't found anything to guarantee that. We couldn't use the Community feature without that guarantee.